What does the 'internal market' mean? The EU is committed to the construction of an internal market, and in this analysis Stephen Weatherill explains that the EU's internal market is an ambiguous legal concept. One may readily suppose that the United Kingdom possesses an internal market. So does Germany, so does France, so does Australia, and Canada, and the United States of America. The European Union aspires to an internal market, but the detailed patterns governing these several internal markets are not uniform; in fact they vary according to the extent to which the constituent units are permitted to pursue different regulatory policies. They vary according to the scope of law-making competence and powers allocated to the central authority. They vary according to the governing institutional (judicial and political) arrangements. The quality and intensity of the regulated environment varies according to the choices made. 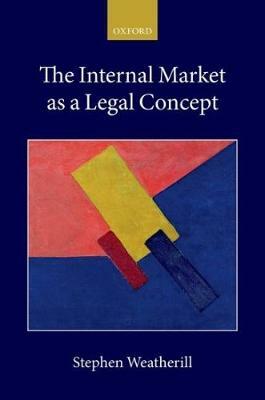 There is a broad band of possible internal markets, ranging from one that is radically decentralized as a result of a choice in favour of unrestricted inter-jurisdictional competition to, at the other extreme, one that is radically centralized in the sense that law-making competence has been completely stripped away from the constituent units in favour of the central authority. Within that spectrum there is a huge range of options.In this inquiry into the limits and ambiguities of the internal market as a legal concept, Weatherill examines and explains the choices made by the EU and demonstrates what they entail for the shape of the EU's internal market. This book is not about 'Brexit', but it shows that one of the claims commonly made by Brexiteers - that the internal market can be confined merely to a deregulatory exercise in free market economics - has no support whatsoever in either EU constitutional law or in EU legislative and judicial practice.